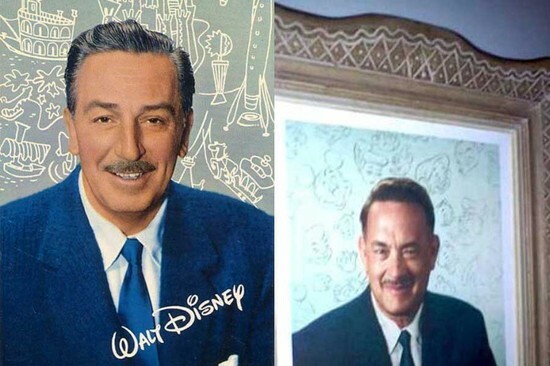 The Disney Den: Tom Hanks as Walt Disney? This week, Tom Hanks was spotted on set of his newest drama, Saving Mr. Banks dressed as none other than Walt Disney himself. Of course, I immediately wanted to know more about this film. Turns out, Saving Mr. Banks is a new biographical drama film about the production of Disney's Mary Poppins. As previously mentioned, Tom Hanks will be playing Walt Disney. Hanks prepared for his role by visiting The Walt Disney Family Museum and interviewing some of Disney's relatives such as his daughter, Diane Disney Miller. Emma Thompson is going to be P.L. Travers, Colin Farrell will be Robert Goff Travers, and Paul Giamatti is going to be Travers' chauffer, Ralph. I remember reading about the production of Mary Poppins and remember it wasn't an easy one for Disney. P.L. Travers was hesitant to give him the rights to make a movie and was worried they would ruin the book. However, Disney insisted and managed to strike up a deal. After the movie was finished, Travers wanted to change some parts of the production. Disney just looked at her and told her that all the rights to the movie belonged to him once the film had been finished, and there was no going back. I've always wondered who would be a good Walt, and I'm curious to see how Hanks is going to pull it off. He obviously has some resemblance physically, but the acting is going to have to speak for itself in order to pull it off. It will be curious to see what happens. Saving Mr. Banks comes out in theaters December 2013. Hanks is usually an excellent actor and I think he can pull of the role. Although he would needs to change his voice to fit role but he did sound vastly different in Forrest Gump. I do trust him with the role more than other people. It's also nice to see how dedicated he is to learn more about him and his family by doing research ahead of time. Yeah, his voice was the main thing I was worried about haha. But you've got a point with Forrest Gump. It'll be fun to see what happens!